The theory is able to explain the most difficult phenomena using the same philosophic framework. His friend who is a physicist, told him, after reading my second book on the subject, that I had discovered the philosophy that string theorists have been looking for. The theory does much more. It unites parts of quantum mechanics with parts of string theory. It does it by first assuming that the universe is the product of information and the information forms the matter world we live in. A very brief explanation follows. You can read the complete explanation in the book for FREE, if you are an Amazon Kindle user, for the next 60 days. The information comes into this dimension 90 degrees out-of-phase from the matter world. The following graph depicts this idea. String theory starts by assuming that a one dimensional string vibrates at a specific frequency and traces out a plane, shown below. 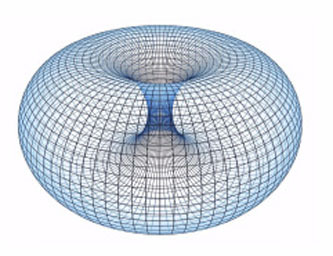 Closed-end string theory attaches two opposite sides to form a tube. My theory takes the tube and connects the two open ends together to form a toroid shown below. The theory holds that hundreds or thousands of separate frequencies that form each atom are transmitted on a carrier wave that pulses at a common frequency, which we will assume is Planck’s time. 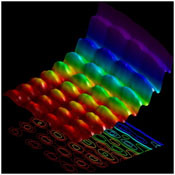 An Italian team at EPFL led by Fabrizio Carbone was able to capture the first-ever snapshot of the dual behavior of light. Notice that regardless of the color frequency change, they all pulse at the same rate. The Theory of Multidimensional Reality successfully explains what light is and why it possesses both wave and particle properties. The theory and the evidence presented in the book prove that our reality is the product of a synchronistic system that has clock cycles in it. The German gravitational wave detector observatory, called GEO600 came to the conclusion that the detected “noise” could not be explained until the idea was proposed by Juan Maldacena that the “noise” was the result of the possibility that our Universe was a hologram. My information theory of existence proves it. In 1989 I discovered evidence of the main clock cycle in the universe. I discovered six blank periods in space where no stars were visible from 977 to 1304 light years. The stars are there and there is a reason we cannot see them, which is explained in this book and in my 2007 book God’s Day of Judgment, the real cause of global warming. Among the six blank periods, four of them are 12,068 light years apart. This is hard evidence of the clocks sysle in the universe. I was also able to derive the same 12,068-year cycle in the sunspot cycles. A sunspot cycle is 11.09 years, eight of them is called a Gleissberg cycle, equaling 88.732 years, 136 Gleissberg cycles total 12,068 years. The sunspot cycle is a resynchronizing frequency. 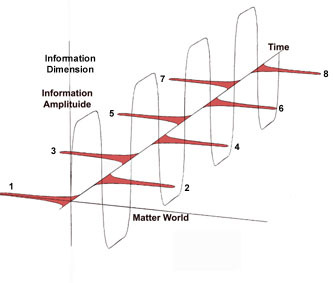 The Gleissberg cycle is a synchronizing frequency and it is synchronized to the main clock cycle. My 2007 book explained what causes the geomagnetic reversals and why they correspond to the ice ages. I was able to C14 six of the reversals and ice ages to a 12,000-year repeating cycle. I have discovered this clock cycle three different ways, which is hard to disprove. 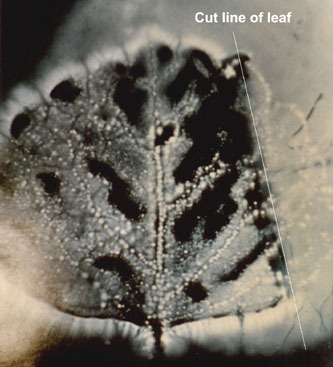 Another piece of evidence is the phantom leaf effect of Kirlian photography. I know this phenomenon has been ignored by the science community, but it should not be. It is a repeatable experiment. 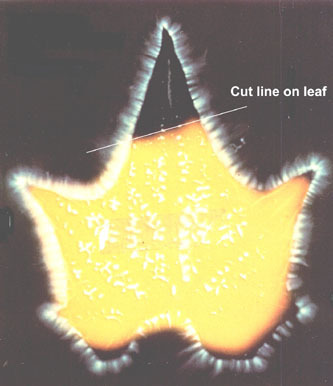 It shows the cut off missing part of the leaf is still visible as bubbles and streamers of light, even though no matter is present. It does bring to question, what is light if no matter is present. What light is, is explained using the theory. What the phantom leaf effect proves is that the information for the “conscious” part of the leaf is still being transmitted for a few seconds to the same coordinates in time and space. This cannot happen unless the information for the whole leaf is being transmitted from another dimension into our created reality. 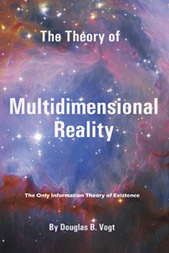 A complete explanation of these phenomena and many other are explained in the book. In the book, the author dedicates the book to applying the theory to explain all the hard phenomena, such as: What is light, time, gravity, it redefines the dimensions, the energy output of Quasars, how the atom is created in this dimension, and many others. The author calls this information theory of existence a foundation philosophy that all other sciences will build upon and will replace the matter-oriented theory of existence currently taught. If you are a physicist, physics professor or a science teacher and would like to use this book as a text book, we offer discounts to schools and colleges. Order Kindle version or book from Amazom. Order Book from Vector Associates. ISBN #: 9780930808105; LCC: Q175.V6384 2015. Paperback, 100 pages. Price $14.95. e-Book version: ISBN #9780930808112; Price $4.95 from Amazon Kindal.